>Well, despite my arguments to the contrary, we actually have snow again in Baggins Bottom, and it’s quite good snow too. When I got up for work this morning it was still snowing quite heavily, so I decided to research public transport and come in by bus and train. I fired an email off to my boss, packed a rucksack, dressed appropriately and headed off. It didn’t take me long to drive in, there was hardly any traffic on the roads, and the main roads were very clear. Even at work they’ve been shovelling snow, but we could do with some grit on the footpaths. And so I made it in (the filing cabinet wasn’t actually locked …) and I’m going to save everything and anything I can work on and head home again before it all freezes. I’ve had no material for the activity annual, but the goal posts have been changed so I think we’re revisiting that situation. It does mean I wasted the last 5 days waiting for it, though. My new phone arrived so I’ll also be playing with that. Below you will find the first of my Write Brain exercises. Email me if you want to know what the basic exercise is, in case it’s not clear from what I’ve posted. Sometimes I feel just like a gerbil, running around and around on his wheel! [sic] It would be so much more fun on a carousel. I could sit down for a start and give my little legs a rest and maybe look at the countryside instead of concentrating on the road all the while. That’s why I like to be driven every so often. I get tired of driving all the time, having to keep alert, watch the road. Of course when you’re on your own most of the time you pick up bad little habits or forget your manners, which is fine when there’s no-one around but flatulence can be a bit of a problem when you’re in company, or even in a queue at the supermarket, for example, or in a bank. The silent kind aren’t such a problem but … well, you get the picture. I do like company, though. I like to have friends to go out with. And if we go to, say, the seaside or a place of interest, I like to buy a little keepsake, something aside from photographs to remember the day by. I’m going “home” in a couple of weeks for a night out with some of my old Brummie mates. I used to steal pub ashtrays in the old days and those were my mementoes from great nights out with friends. Not much hope of blagging an ashtray in these no smoking days. I’ve also collected match books, but those will have the same problem attached. My buzzer has gone, my first 10 minutes are up, and this isn’t much of a “story”. It is, however, 291 words of pure abandon. I’ll try not to peek at tomorrow’s exercise until tomorrow. Q. In terms of writing practice, what type of gerbil are you? A. 2 Avoiding the wheel. Q. If writing practice were an airplane [sic] instead of a gerbil’s wheel, what would you do differently? A. I’d avoid climbing the steps. Probably. My writing lately has been lacking fun. The moment I realised this I felt a whole lot better. Even the NaNo thing was quite regimental and business-like and I remember how prolific I was when I was doing it for me, and how much I enjoyed it. I’m not one for meaningless exercises. Maybe this is the jobbing writer in me, the one that needs to maximise earning potential, but I can’t sit and write about … I don’t know, the shape of a pebble, or a dream sequence, or 5 different versions of the same conversation from 3 different viewpoints – I think you know what I mean. If an exercise doesn’t earn its keep, I’m out. 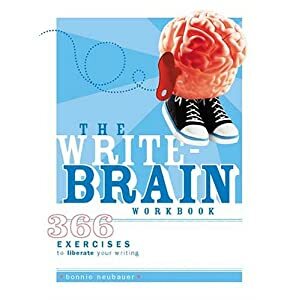 This book, The Write Brain Workbook by Bonnie Neubauer, has been sat on my bookshelf for about a year. I glanced down at it last week when I was tidying up for my house guest and thought I really ought to have a flick through, because I bought it because it looked like fun. Tonight I finally picked it up. And so I’m going to make a promise to me and to you. I’m going to work my way through this book, in order, and try and do one exercise a day. I’m not going to start on New Year’s Day, I’m going to start tonight, which means on 30 November next year we should be at exercise 366. And to make sure I do it? I’m going to post them, first draft, warts and all (and copyrighted! ), in here alongside whatever other regular posts I make but in any case there will at least be one of these for every day. Even if I don’t post them straightaway I’ll do so as soon as I get to a pc, with the date on which I did the exercise. If you have the book too, please join me. I’ll post tonight’s tomorrow morning before my regular post for that day. Time to crack that whip, ladies and gents. Your feedback would be much appreciated. >So on Friday when a THIRD organisation helped themselves to my cash I got a little bit cross. Yes, sometimes these things do happen, but THREE times? First up was PC World. I’d cancelled their Direct Debit but their excuse was: “We thought it was an error at the bank.” Did you know you can cancel your DD online but the company can STILL collect their money? Cancelled it AGAIN and made sure I got written confirmation. Then it was my mobile broadband company helping themselves to the price of a modem. Erm, the modem was free, it was faulty, I sent it back. They’d not received it so they charged me for it. Two days later they agreed that it was obvious by my severe lack of data usage that I didn’t have said modem, and they agreed to refund the money. Gee, thanks. Finally it was my motor insurance company helping themselves to just a tenner, calling it my credit arrangement fee. Erm, I paid that to my broker, give it back or I pay off the whole insurance in full and you lose your interest. They said they’d give it back. But I was so cross by this time. I called my mobile phone company and told them I was so disappointed with their broadband side helping themselves to £45 without warning that I wanted to cancel my agreement with them as soon as my contract is up … they talked me into a brand spanking new phone and a new price plan that will cost me £14.20 less per month – that’s a saving of over £170 for a whole year … so much for me cancelling the agreement. Ahem. Here is my new phone, which will be white. I’m not sure that I’ll like it but I’ll try it for a few days. I have 14 days to send it back. This morning loomed large and vaguely snowy, but not enough to bring us to a standstill … or so you’d reckon. There is a lot of snow between here and Birmingham, though, with more forecast. So my trip tomorrow has been cancelled. Because of this teensy, tiny bit of snow we’ve had (honestly, I can still see the road! ), we had no post, and that meant no activity annual artwork. If, indeed, they sent it. So I did a bit more writerly work, a bit of admin, and I cooked some food for the garden birds using some of my ingredients that are past their sell by date. I hope they like it, there are 2 fat balls out there already, plus seed, water and bread, but I have 3 fat cakes setting (hopefully) in the fat cake holders I rescued so I could make them the right size and 2 more fat balls. The balls have rice and flour and fat in them, the cakes have flaked almonds, mashed banana, flour and fat. It looks as though the gig buddy may brave the roads later and go out, so I might not be going there for tea after all. I’ll probably do some baking today, and I’ll do the bread tomorrow as I’m in all day now. >Considering I was off sick yesterday and didn’t surface until midday, I still got a few things done. First of all there was my blog post (the NaNoFail one …), then I revisited my diary for the next 2 weeks, then I liaised with my editor and did 2 drafts of the running order for the activity annual, and I wrote the 1st draft of my media kit for the blog tour that hopefully starts next week. I also started off an exercise book listing all the activities I’d like to include in this and future annuals, so I have them all in one place. I’m starting to love all of my different exercise books. For tea I cheated and ordered a Chinese, ate half and saved half for tonight as I may as well do the shopping on my way home again. Later today I’ll polish the media kit, but if any of you have any questions or anything specific you’d like me to write, please let me know. Otherwise feel free to lift whatever you want or need from the kit and be prepared to ask questions after you receive it. I’ll have another go at fitting the wrong number of pages into my 28 or 32 page magazine page plan. I also hope to see the artwork for the activity annual because I may have stayed at home another day had I not thought it might be here. If they send it to home today, though, that means I’ll have to be on hand tomorrow to listen for a postie. So I’m hoping it comes to work. If I had any hope of getting anywhere close to my NaNo target, I needed to get my head down and go for it. And I’d made a start too … but when I woke this morning I felt so rough I stayed in bed and fired a message to my boss telling him I’d probably swap today with next Thursday. The intention was to stay in bed for much of the day, but then an urgent email came through to the mobile phone … Note to Self: When ill in bed, switch mobile OFF. Anyway, the activity annual for which I have been waiting on artwork for over a month needs to be in on 6 December … [GULP] Now I know I’m good, but … Fortunately I had a list of activities I wanted to include and my editor just sent me the necessary page plan so I can get on with the running order. But until the other materials arrive, I can’t do more than plan. If the artwork arrives tomorrow I really need to well and truly knock NaNo on the head because this is a good earner for me. It was my first time at NaNo though, and I’m glad I did it, I already learned a lot, I have more than 15,000 words I didn’t have when I started, and I met lots of lovely new people. But if I can’t do it, I can’t do it, I have to concentrate on the revenue-earning stuff first where I can, and I don’t want to burn out. And anyway, I can still build it into the rest of my regular writing schedule. This means I’m going to be quiet for a few days, so apologies for that. If I’m not working, however, I’ll be baking. And if these germs aren’t gone by Sunday, I’ll also postpone my trip to Birmingham. I’d like to say I’m feeling 100% groovy, but as I currently have a head full of cold, that’s not quite true just now. However, I’m searching my inner sanctum and my gut is feeling … cool and chilled, for me and for all of my friends and family. It’s taken a while for me to trust my gut, some of my friends were there before me, others are still slightly cynical but getting there. It’s feeling very cool in South Yorkshire at the moment. We apparently have a bit of a breeze coming in from Scandinavia and Russia, so I guess that makes it a north-easterly wind. The S word has been bandied about, on the television and on Facebook. Some it is reckoned to be here by today, some by the weekend. I thought the throat and back had eased off a little, and the back has. But I do feel a bit like death warmed up. I’m visiting my mom and dad on Sunday and I’m sure they won’t want me to fetch any germs with me so I hope it’s gone by then. I’ve had quite a few offers to guest on various blogs during my upcoming tour, so thanks to everyone that has commented in here, on Facebook and by email. One of the jobs I really, really need to do is the publicity pack. But if anyone would like me to concentrate on anything in particular, do let me know so I can incorporate that too while I’m still working on it. I hope to start a 4-week blog tour next week, but I won’t do a guest post every day, maybe do a couple in the first week, another couple in the second week, and so on. I don’t want to go into overdrive, but I’d also like to spread it out a little to maximise coverage without getting on everyone’s nerves. I will be getting in touch with everyone in the next few days. I bought 3 different types of bread flour last weekend because I want to have a go at baking some loaves. I’ll start with a basic white and a basic brown, but then I want to try a granary and maybe some shaped loaves or rolls. I like the look of a milk roll too, and if it’s anything like the one we can get in the supermarkets it should be nice and soft. I’m also going to try some different cookies because my last batch was so successful. There are some plums ripening in the fridge for a plum crumble and, of course, the festive season is on the horizon. I have some really nice recipes for shaped and iced cookies, either as gifts, as tree ornaments, or just to eat. We had a great weekend and our objective was achieved, job done, move on. We didn’t get to do a lot, we were talking for most of the time again. But we did manage 3 gigs. It was a bit cloudy or foggy or rainy for a trip to the seaside, but we ran out of time anyway. I baked parkin and peanut butter & ginger cookies – I’m getting quite good at cookies now – and there’s not a lot of either left as a couple of band buddies asked me to bring them some to their gig. When the other band buddies realised that they didn’t get any cookies I was a bit in trouble. So next time I bake cookies, I bake a massive batch and wrap them in tin foil to take to gigs. The band members rarely get time to have anything to eat at tea time, so maybe a pile of biscuits will be appreciated. Things aren’t great now, though. My back is absolutely killing me from standing up at 3 gigs in 2 days (but I did get a massage! ), and I have a bit of a throat … never a good thing. But I’m back at work and ready to clear the decks before December gets under way. I didn’t do any writing whatsover over the weekend, so I have a lot of work to do now. I’d best get on with it. My friend Devon moves house today. This massive life change has been a long time coming, it’s not been an easy ride, and it’s no short distance either. Therefore I’d love for everyone that knows her, and even those that don’t, to send happy moving vibes for her and her “family”. She’ll be offline until Monday when I hope she’ll let us know how it all went. We’ve followed this journey with her and we’re all very excited that she’s finally going, her new house sounds adorable and I’m looking forward to the tales she’ll have to tell. More and more material is coming in for the magazine, with more and more people wanting their stories to appear. We are actually past the deadline for this one, and we may be getting a shorter word count in the new layout. So I can’t promise anyone that I’ll fit them in at this stage, but we’re also trying not to put them off. This magazine has gone from the editors struggling to find material to folk clamouring to get in there. This suspension, however temporary, is plain ludicrous. But … ours is not and all that (and I’ve said that before). Today, after work, I have a hair appointment, and then I start entertaining (oh, the joy of having someone to cook for) (no trifle, though – I DO NOT share my trifle) (ha ha ha – we’ll probably have fish n chips from a fish shop on Friday, a Chinese takeaway on Saturday, and fish n chips again on Monday, but it’s the thought that counts). On Saturday we have maybe the pictures and at least one gig. On Sunday we fight over who cooks Sunday dinner (at dinner time and not teatime), then we have a teatime gig and an evening gig. On Monday we may go to the seaside. On Tuesday I get my house back! I’m signing off for the weekend now, be back on Tuesday. As you can see we have lots of things planned and lots of chill time too, but the thing I’m going to enjoy the most is the company and showing an old friend some of my new friends. If we get pictures, and if I get chance, I’ll post a pictorial.